When Stanley Milgram did his famous study on if people were willing to torture others (so long as they thought it was part of a scientific experiment), he found out that the more distance they put between the torturer and torturee the more brutally they would behave. People would dial the voltage up to x if they were holding the hand of the person getting shocked, a bit more if the person was on the other side of a glass wall, and a bit more if they were behind a brick wall. OMG I Just Lost 3,000 Pounds! 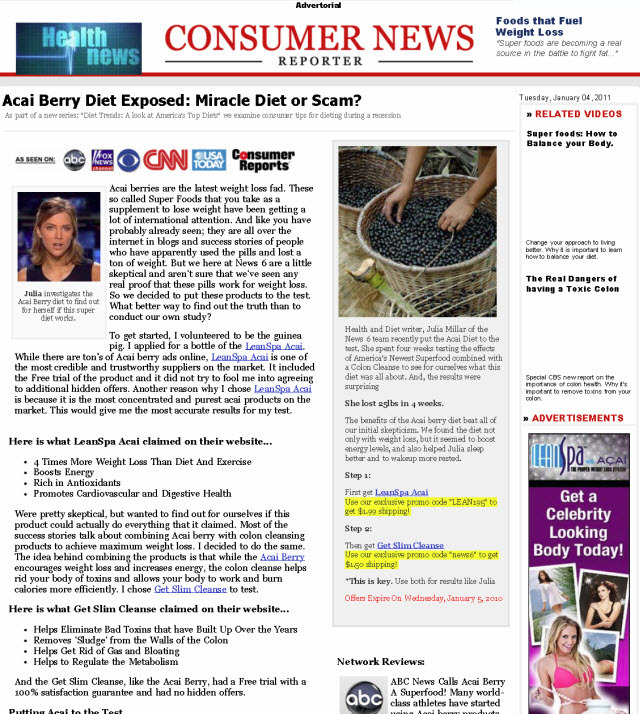 The fake blog (flog) strategy where a woman writes about how she lost 40 pounds in a month due to Açaí & colon cleanse was an economic "innovation" where affiliates could rope a person into 2 fraudulent reverse billing scams at the same time. Public relations hacks were quick to adopt the fake blog "innovation" for their corporate clients & such gems like Walmarting Across America & Working Families for Wal-Mart were born. Affiliates who needed to differentiate from all the other affiliates needed a new round of "innovation." So they would take the items or categories or topics they were selling something similar to & add a "as seen in" section on their websites highlighting how something tangently related to what they are selling was once mentioned in the media in some way. Ultimately sales is not an event, but a process. Which is why the above mentioned reverse billing scams only charged shipping off the start, so the perceived risk was lower than the actual risk (much like bad faith insurance companies that take your money until you need what you paid for, and then manage to disappear). The scammers eat off the plates of everyone honest in the marketplace. Multiple times a month I get refund requests from people who bought something totally unrelated to us from Clickbank, demanding I give them their money back for something that is in no way related to us. I highlight that refunds at clickbank.com is where they need to send their emails, but for every person who manages to get their money back there are likely 5 or 10 more people who are disillusioned & less trusting of online markets & online marketers. 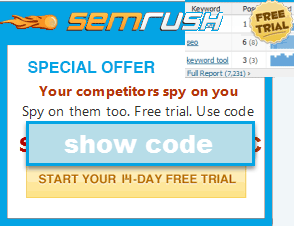 Circling back to the SEO & PPC niche, Google has to deal with the scams & scammers every day. In certain cases where it is exceptionally profitable (say illegal prescription drugs, knock off goods, Obama mortgage modification) Google may choose to look the other way / have lax policy enforcement, but at some point looking the other way creates financial risks & a risk of brand damage. Doing What is Easy = Doing What is Best? Generally when it comes down to it, Google's revenues are heavily concentrated & no matter how widespread or profitable any individual scam is, they can cut it out of their ad network without being overly concerned. Last September AdAge shared data showing that there are around a couple thousand advertisers spending over $10,000 a month on Google ads. While the longtail concept is widely praised, in the search ecosystem it reflects more on products rather than merchants. 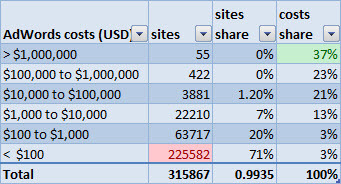 Some time ago SEM Rush sent me the following chart highlighting AdWords spend breakdown estimates. Their numbers are based off of the publicly shared Google keyword estimates (which generally skew toward trying to get advertisers to spend more), and I believe they may count certain AdWords ad management platforms as being 1 advertiser each, but yet again Pareto principal appears in the data & Google could keep roughly 80% of their US search revenues if they only accepted ads from the top 5,000 advertisers (out of more than 300,000). And those estimates were before Google widely launched their CPA product ads, which only further consolidate traffic to a smaller number of websites. Ultimately Google can try to police an ecosystem of x thousand companies or an ecosystem of x million companies. The latter will have more innovations in it, but also a wider variety of scams & be much more expensive to police. This is a big part of the reason Google has felt the need to become more & more portal-like over time. Their engineering culture assumes that they can do it better internally. Depending on how your positioned, their anti-innovation "do what is easy" approach to search can either be a boon or a major hindrance. The companies that were worried about maintaining complex search strategies which sorta fell into top rankings on the Google brand +1 obviously benefited. But Panda (and Google's approach to AdWords) keep raising the bar on smaller businesses. A friend recently had their AdWords account penalized for running an "arbitrage" business model. To appreciate how arbitrary the above editorial judgement is against that webmaster, not only were they 0% responsible for the alleged editorial infractions, but 3 hours after the sincere "notification only" email Google did a follow up which said the site was once again approved to advertise, but the ads need to be re-submitted for review. We live in a world where flagrantly parasitic sites like Mahalo required "an algorithm" (with endless collateral damage) to fix & yet the above sequence is somehow a reasonable way for Google to treat there paying customers. Much like there is "too big to fail" there is also "too small to matter" but if you look at Google's numbers you can see how that happens. We are basically expecting them to be better than all other monopolies if we expect a level playing field. Some smaller advertisers may get their AdWords campaigns disabled because they offer a freeware trial, where a person has to buy the full version to unlock all of it's features. Google suggests that these advertisers lead with the disclaimer that a customer may eventually spend a Dollar if they like what they are trying, but sales is a process rather than an event. Sometimes you first have to show proof of value before people are willing to spend money. The problem is that if you are paying for every click & you have to lead with your disclaimer of potential cost for a full upgrade (and so on) then you are not going to be able to compete with a larger brand that does not need to clearly display disclaimers. The flip side of the above is that Groupon can put their TOS in a foreign language & it is no big deal. You can only have a strong conversion-oriented page with message clarity if you are a brand, otherwise you need to LEAD WITH THE DISCLAIMERS, which never works if you are paying by the click in an efficient market if you are taxed x% of conversions upfront. Not only are brands given leeway, but Google also allows their own products & services to routinely violate the terms of service they push onto others. The footer on Google Advisor states "The information displayed here was provided directly from the issuer and/or collected from the issuer's website. Check the details pages for each offer for the data source and update time. Google is not currently being paid for these listings." Note the "NOT CURRENTLY." So everyone else is required to place the entire info harvesting policy next to the form, but Google can have a "google protects you from spam, Learn more" link which they specifically prohibit just linking to as an AdWords advertiser. Where do you see EXPLICITYLY how you can opt out of communications? Look at the table at the bottom of this page. If you are creative enough you can say that disclosure doesn't have to kill conversions, but the problem is that sometimes it does. And when it does, it is not like there are many other avenues for you to compete online. In some markets Google owns over 95% of the search marketshare. The brands always have the flexibility of setting up a mini-site to test if unbranded works better, but the non-branded smaller advertiser doesn't have the option of using similar textual formatting to their larger competitors. Online self-regulation of ad networks is going slow because ad networks prefer to focus on arbitrary technical limitations (that they can later worm around) rather than focusing on the real world impacts of how people are profiled. Part of the reason Google & Facebook are willing to invest into smearing each other publicly is they are trying to damage each other's brands so the other is trusted less, so that they may build an asymmetrical information advantage. In the past I highlighted how some webmasters have trouble ranking for their own content due to duplication & how it could even impact their ability to buy ads. Ultimately this leads to some level of fear & indecisiveness amongst many small business owners who may become afraid to have duplicate content anywhere on their sites. Google runs a product search engine, Boutiques.com & Like.com. Google runs Google video search, Youtube & Vevo. Bankrate runs Bankrate.com, CreditCardGuide.com, CreditCardSearchEngine.com, Interest.com, CreditCards.com, and NationwideCardServices. The Panda update made it so that certain businesses did not need to build (m)any links to compete, while some other businesses were required to build many more links to stay competitive. Brands rank because Google puts weight on brand-like signals (and they can get away with link buying which smaller competitors would get torched for). Then Google claims that the link buying is irrelevant because it doesn't influence the search results. With that sort of circular logic why does Google even care about paid links at all? Why do they arbitrarily police one segment of the web? On the flip side, there is a suspicion of smaller webmasters which is core to how Google operates (even if the site they are passing judgement on ranks right at the top of the search results for core industry keywords & is linked to organically from top newspapers). Sometimes it is a "shoot first, ask questions later" approach. Why, in this instance, do they suggest they can identify the problems & that a business owner should first be penalized for it, then need to fix it before reconsideration, all the while some larger businesses do the same exact things but Google looks the other way because they claim to have already detected it? Why does one form of detection require penalization while the other doesn't? During the Panda update many small businesses (which did nothing wrong other than participating on the same Internet that the likes of eHow abuses) got torched. They were given abstract qualities where they need to improve on. Over 3 months later they are still in the dark hoping the penalty clock hits zero before the bankruptcy clock does. When traffic heads south & becomes unreliable a business not only loses that income, but it also loses negotiating leverage with suppliers. The uncertainty not only retards investment, but may lead to physical, emotional, social & mental health issues. People make better life decisions when they are driven by love than when they are driven by fear. The one big counter-trend to the move away from small businesses is Google's increased emphasis on localization, which allows some small local businesses to participate in search markets that they were simply priced out of in years past. As I've mentioned before, I was banned from Adwords for an 8-year-old ad. Recently, I received a coupon for $100 worth of Adwords credits because I'm a "valued Adsense publisher". They actually sent me a letter encouraging me to promote my Adsense site via Adwords. My wife (who also has an Adsense account) received a similar letter. So Google encourages a business model that they will ultimately ban you for. Adding insult to injury, Google sends this to me after I've already been banned from using Adwords. Additionally, were my wife to take them up on the offer, she would be insta-banned with an "associated accounts" ban. So Google is probably the most aggressive data collector in the world, makes it nearly impossible to open a new account once banned- but I'm to believe they can't figure out they're sending this mail to someone they've already ejected from Adwords? Small business could never be so sloppy as to send out thousands of mailers to prospects completely unable to use their product. ...that they are too big & grew to fast. I mean there is no reason they would want to go out of their way to spend money on tarnishing existing pleasant business relationships. I can sorta understand the not liking of click arbitrage business models (but can't understand the funding of the likes of Ask.com's arbitrage), however I doubt Google is intentionally sending out AdWords coupons to AdSense publishers so they can torch them. My guess is that is just general corporate dysfunction. That's what I was getting at. I wasn't suggesting they were setting people up. Simply that the left hand doesn't know what the right is doing. And if you get caught in the middle...well, you're out of luck. Can't put it any better than you have already done Aaron "My guess is that is just general corporate dysfunction." They are dysfunction at VARIOUS levels. A couple of years ago Google sent me a free Adwords coupon. I did nothing about it. A month or two later I got another one. I did nothing about it. A few months later I got another one. I thought, 'sod it!' A check at the time found little information about duplicate accounts, so I opened up three accounts. Got one account up and running. 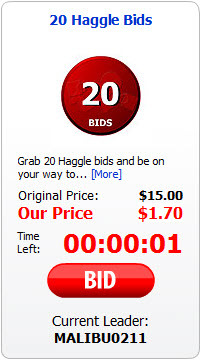 A month or two down the line found out that the trademarked term I was bidding on wasn't displaying ads. So I dropped the trademarked term. All my competitors carried on using it (and are still using it). Then I was told I was banned. Then I was told the (fictional?) specialist team had rejected my appeal (copy and past email widely replicated across the internet). Then I realised that advertising on Google was a complete lottery and that they really didn't give a damn. So my mindset now is to head to the offline world. and forget that Google Adwords and Adsense even exist. Is It Even Worth Bothering To Try Anymore? 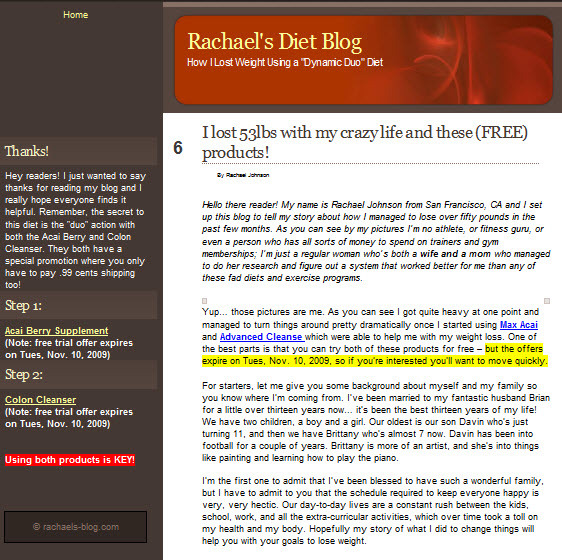 Been reading your blog for some time now, and lately (especially post Panda) I find myself if it's even worth trying to SEO if you're a small fish. Local markets, as you said, still seem to have some traction...but for how long? Is it really worth the blood, sweat, and tears of trying to give The Algo what it wants today? Two years ago it seemed like SEO was a solid strategy that clearly paid dividends. After Panda, and especially after reading one of your posts like this one, I really wonder what the odds are with SEO if you were starting from scratch with no brand and a small, new site. I highlight some of the challenges we face & in what some would consider a pessimistic manner, because ultimately facing those issues directly (as they are) gives you the conviction to change strategy with the algorithm. I think the strategies change, but SEO doesn't really die. If I were starting from scratch today without any money & without my knowledge & without accessing this site I might be hosed...especially if I wasn't passionately driven by something. But if I was starting from scratch today with the passion I had in 2003 I would still do great today, especially with access to sites like this one. The large changes are obviously uncomfortable when we live through them, but it is that layer of unpredictability which preserves opportunity for those who persevere. If it were infinitely predictable & infinitely scalable (like eHow) then over time investors would drive the margins toward 0. The sharp shocks feel brutal, but they are far better than a slow continuous bleed.